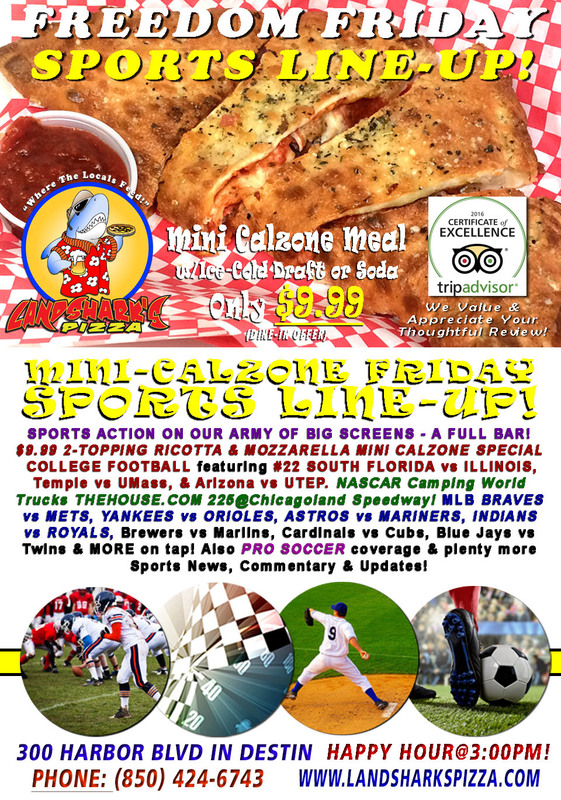 / Best Calzone in Destin FL / Exciting COLLEGE FOOTBALL & NASCAR Freedom Friday $9.99 2-Topping Calzone w/Brewsky! Exciting COLLEGE FOOTBALL & NASCAR Freedom Friday $9.99 2-Topping Calzone w/Brewsky! 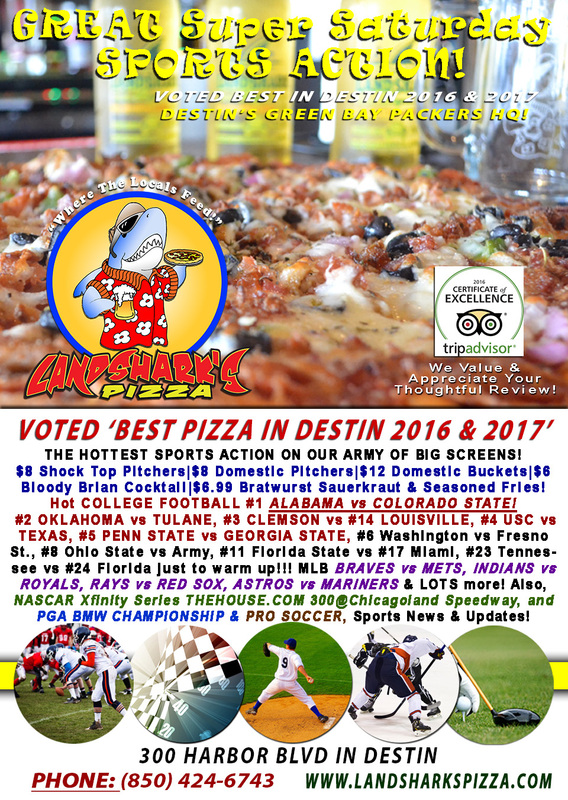 We’ve got NASCAR Trucks, College Football and exciting end-of-season MLB, championship golf and more at Landshark’s along with a 2-TOPPING RICOTTA & MOZZARELLA MONSTER MINI-CALZONE with an ICE COLD DRAFT or Soft Drink only $9.99 dine-in special to go with great sports on an army of big screens and a full bar! 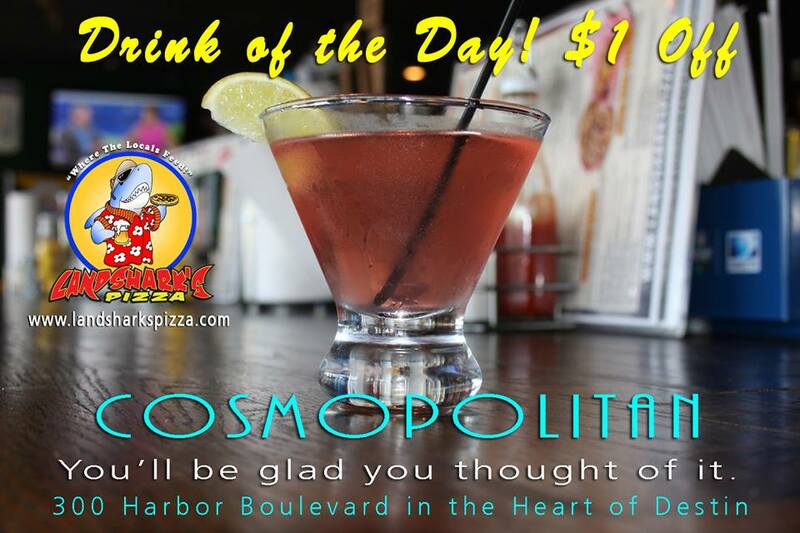 LANDSHARK’S DRINK OF THE DAY – $1.00 OFF today’s drink is the Landshark’s ‘COSMOPOLITAN’ cocktail! SPORTS ON OUR ARMY OF BIG SCREENS – COLLEGE FOOTBALL #22 SOUTH FLORIDA vs ILLINOIS, Temple vs UMass, & Arizona vs UTEP! NASCAR Camping World Trucks Series THEHOUSE.COM 225@Chicagoland Speedway! 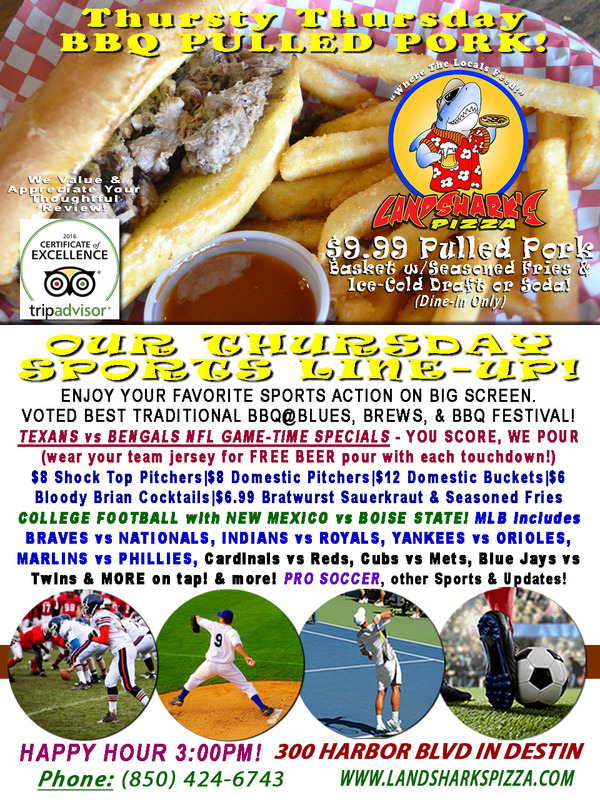 Major League Baseball featuring BRAVES vs METS, YANKEES vs ORIOLES, ASTROS vs MARINERS, INDIANS vs ROYALS, Brewers vs Marlins, Cardinals vs Cubs, Blue Jays vs Twins & LOTS more on tap! Also we’ve got PRO SOCCER coverage and plenty of other Sports Broadcasts, Sporting News, Analysis, and Commentary! NFL This Week: Full slate of games on Sunday (17th)|Mon (18th) Lions vs Giants. PGA This Week: BMW Championship@Conway Farms as Dustin Johnson defends. NASCAR This Week: (Tomorrow) Xfinity Series THEHOUSE.COM 300@Chicagoland Speedway|Tales of the Turtles 400 (Sun 17th)@Chicagoland Speedway. CALL LANDSHARK’S TO CATER YOUR EVENT – 850-424-6743! Previous Post: « TEXANS vs BENGALS! ‘YOU SCORE, WE POUR’ NFL Specials, College Games, PGA & MLB, $9.99 BBQ Basket & Draft or Soda!